Maynard Ellsworth Dammann, 94, of Lester Prairie, died Wednesday, Feb. 7, 2018, at Glencoe Regional Health Services Long Term Care. Casket bearers were Steven Dietel, Michael Dietel, Daniel Griesmann, Brian Baumann, Travis Dammann, Cory Dammann and Benjamin Baumann. Interment was in the St. Paul Evangelical Lutheran Cemetery in Lester Prairie. Maynard Ellsworth Dammann was born Nov. 21, 1923, in Bergen Township, McLeod County, the son of Ewald and Martha (Voss) Dammann. He was baptized as an infant on Dec. 9, 1923, by the Rev. Walter Baumhoefener and was confirmed in his faith as a youth on March 21, 1937, by the Rev. J.A. Schert, both at St. Peter’s Lutheran Church in Lester Prairie. His confirmation verse was Psalms 143:10. 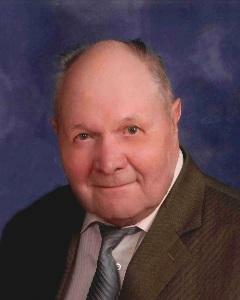 He received his education in Lester Prairie, graduating with the Lester Prairie High School class of 1941. On Sept. 2, 1945, he was united in marriage to Mabel Lilly Martha Miller by the Rev. R. Ehlen at St. John’s Lutheran Church in Plato. They made their home on a farm in rural Glencoe until 1982, when they moved to Lester Prairie. In June 2014, they moved to Grand Meadows in Glencoe. Their marriage was blessed with four daughters and one son, Jane, Laurie, Kathy, Marla and Maurice. They shared almost 70 years of marriage together until Mrs. Dammann’s death on Aug. 30, 2015. Mr. Dammann was a farmer all his life. He as an active member of St. Peter’s Lutheran Church and St. Paul Evangelical Lutheran Church in Lester Prairie, where he served on the church boards. He also served on the elevator board in Lester Prairie. He always had a positive disposition and was grateful for God’s blessings. He enjoyed the Minnesota Twins, fishing, and traveling with his wife. He cherished the time spent with his friends and family, especially his grandchildren and great-grandchildren. He is survived by his daughters and their husbands, Jane and Dale Dietel of Lester Prairie, Laurie and Guy Griesmann of Oronoco, Kathy and David Baumann of Lester Prairie and Marla and Gordon Birkholz of Lester Prairie; son and his wife, Maurice and Christine Dammann of Lester Prairie; grandchildren, Steven (Melissa) Dietel, Michael (Jessica) Dietel, Erin (Matt) Herrmann, Sara (Anton) Schmidt, Daniel Griesmann, Jeana Griesmann, Angela (Russ) Ferrara, Michelle Baumann, Brian (Amber) Baumann, Jennifer (Warren) Schmidt, Melissa (Jacob) Mochinski, Kelli (Taz) Fischl, Travis (Ali) Dammann, Cory Dammann and Taylor Kriz; 20 great-grandchildren; sisters-in-law, Barbara Dammann of Watertown, Esther Wroge of Glencoe and Elsa Selchow of Glencoe; nieces, nephews, other relatives and many friends. He was preceded in death by his parents, Ewald and Martha Dammann; wife, Mabel Dammann; brother, Milan Dammann; and brothers-in-law, Helmuth (and Alice) Miller, Herbert Wroge and Carl Selchow. Arrangements were with the Paul-McBride Funeral Chapel in Lester Prairie. Online obituaries and guest book are available at mcbridechapel.com.